It’s time for Easter crafts! Crafting around the holidays is so much fun and we have an enormous collection for you today. These fun crafts and activities range from egg decorating to free printables; from beginner crafts to more advanced. There is so much great stuff here! This list is growing daily so make sure to come back to find even more. Here is how to make awesome Avenger’s eggs with temporary tattoos! Download some super cute Easter egg coloring pages for a fun activity. Make candy play dough! That’s right, you can turn all those marshmallow Peeps into play dough. Print this free Easter card for your kids to color and hand out. You can quickly decorate your very own Easter basket by using this fun free printable. This egg shell Easter mosaic cross craft is a wonderful way to bring in the symbolism of the Easter egg. Here are 15 cool things you can make with Peeps! From Love and Marriage. For a really fun Easter snack, make a bunny out of Reese’s Peanut Butter Cups. Decorate by making these sugar string Easter eggs. Hang them up for festive decor! Use your kids handprints to make this adorable yellow chick craft. Make an Easter bunny with paper and your fingerprints. This is a cute keepsake! 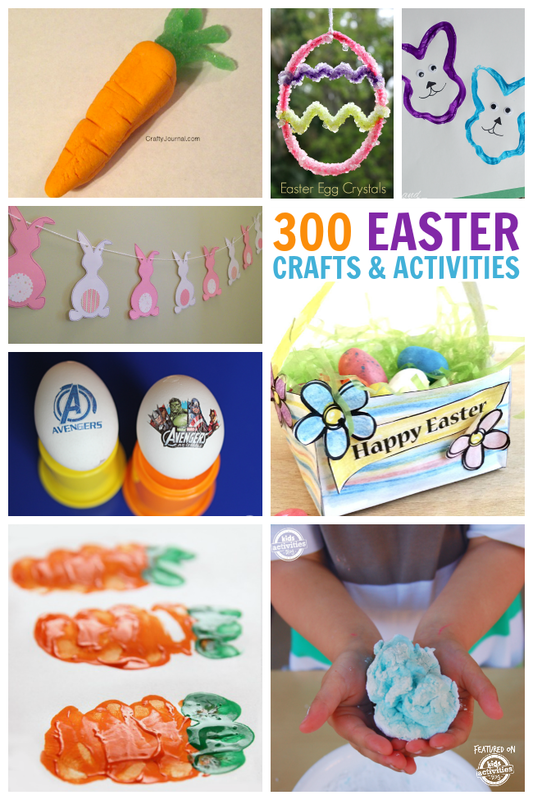 Here are the rest of the Easter crafts and activities. You can even add your own! By linking up, you give other blogs permission to link back to your site and use one photo in a roundup post. Family friendly links only, please.